The game opens with a stripper and a credit roll. Next, a deep voiced narrator introduces two officers of the law, Agent G (just G) and Detective Isaac Washington. You receive a brief bio on the villain you are to intercept in the coming mission and then BAM!, you are off shooting mutants (yes, they are mutants. Not zombies. Even if they sometimes appear to be coming of graveyards.) And that is pretty much what you need to know about the story in this game. Its crazy, off the walls and full of fantastic characters. Its stylish, edgy and offensive in all the right places. I laughed my head off whenever there was an exchange between the two main characters. The supporting cast also has just the right amount of crazy, meaning that although they may have moral problems, you can still identify with them and they are not so “out there” that you don’t understand what is going on. 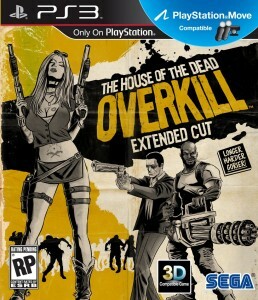 Overall, the story in the game is great and it reminds me of a fantastic, gory, pulpy comic book. 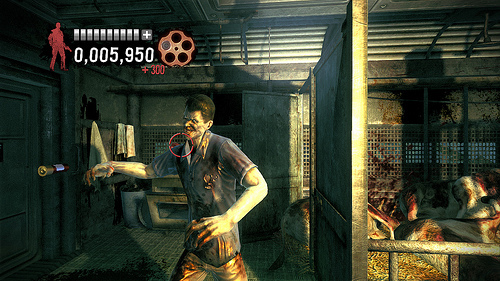 In addition to a stellar story experience, House of the Dead: Overkill has quality gameplay. 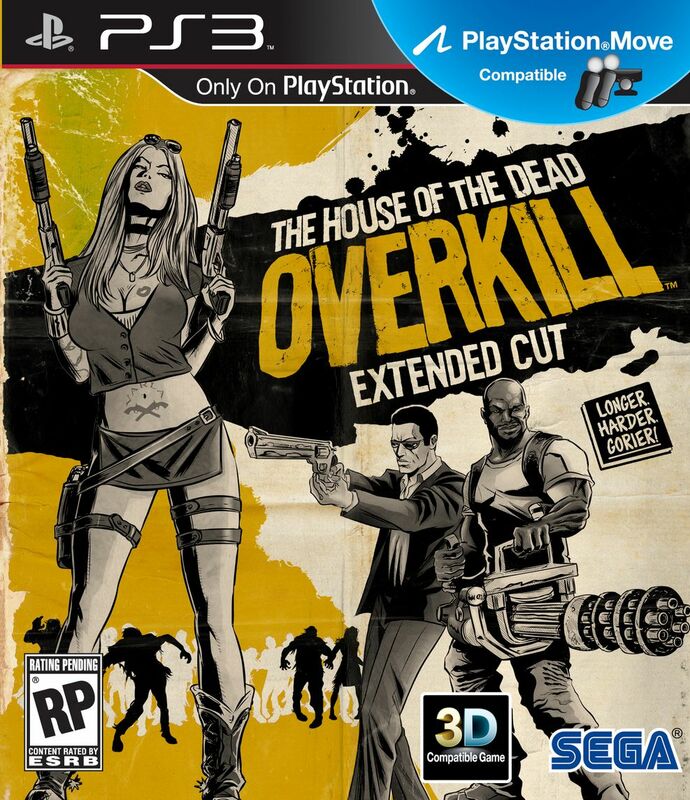 Seeing as how the series has its roots in the light gun genre, it is no surprise that this game has very similar controls, albeit using the Playstation Move instead. You point with the Move, aim your on-screen gun and pull the trigger. That is it. This is an on-the-rails shooter, meaning you basically have no control over anything besides the reticule. However, that does not hold the game back at all. You can still collect items (like cash, health, collectibles, etc.) by shooting at them, and there are plenty of cinematic moments that keep everything rolling and on pace. For example, the game places you in high intensity situations, like rescuing a hostage, and it also has some very exciting boss battles. Just shooting the regular mutants throughout a level is also very fun. If you don’t happen to have a Playstation Move though, rest assured that you can use a Dualshock controller. However, if you do have the Move, then I suggest you play the the game with that. Although my arms got tired and the in-game stats said I was just ever so slightly less accurate, it was much more amusing playing the game with the motion controls. It adds so much to the ambiance and feel of the game. Plus, navigating the menus and other user interface elements felt very clunky with the Dualshock. There are only a few minor complaints I have with the game. First off, I hated how I could not manually reload my gun. Having to wait until I ran out of bullets was frustrating. Luckily the game was easy enough that I rarely ran into problems with this feature, but I still wish I could have done something about it. 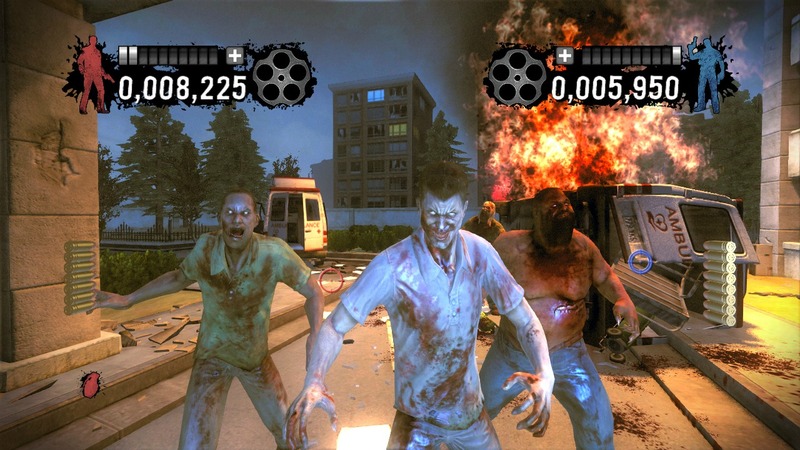 Secondly, although it is a lot of fun to headshot zombies mutants, and take down bosses without ever worrying about strategy, its tough to deny that I would have liked to have a bit more choice in deciding where to go and what strategies to use. However, if you are tired after a long day or just want a casual, mature (with a big “M”) night, then this game requires very little of you to have a great time. Just aim and fire. That being said, this game is only about 5 hours long. However, there are a few mini games, you can go back to beat high scores and there is a coop mode. Plus, there is a Directors Cut mode (where everything is harder) and quite a few different “effects” (think the Skulls from Halo) that can be turned on to enhance replays. The sound effects and soundtrack to the game are great. They completely match the tone of the game. Although the voice acting sounds rough, I believe that that is what the developers were going for, and it definitely adds to the whole flavor of the game. The 70’s musical style also works to the game’s advantage. Be warned though: this game has a lot ‘o cussin’. Indeed, it is well on its way to receiving a Guinness World Record for being the most profane video game ever. So, if you are sensitive about that, you may want to tread cautiously when considering pulling out your wallet. 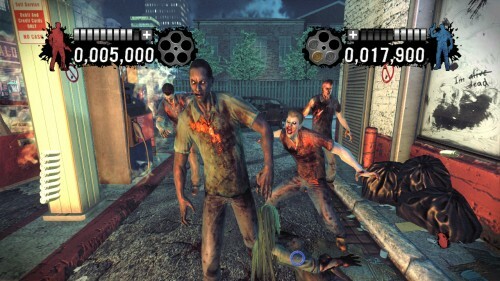 Being a updated for the PS3, this game obviously has HD graphics. However, they are not the most amazing graphics you will ever see. The character models for the most part look ok, as does the backgrounds and other pieces of the game world. Gore and blood as well some of the bosses look spectacular though. Its not the most eye popping experience ever, but is satisfactory. House of the Dead: Overkill has a popping and scratchy effect overlayed on top of the graphics (making them feel like an old school horror movie) and once again, this effect adds a lot to the tone of the game. Overall, this is an enjoyable video game that is worth $40. It was clearly designed for the Playstation Move and that is a good thing. There is nothing more satisfying than poppin’ a freak in the head and feeling like you ACTUALLY had the skill to do that. Headstong made a budget title that is a romp to playthrough, especially with the PlayStation Move, and they did not skimp on atmosphere. This is a magnificent, grotesque shoot ’em up that is worthy of any gamer’s attention.